The Indo-American Arts Council's mission is to promote and build the awareness, creation, production, exhibition, publication, performance of Indian and cross-cultural art forms in North America. IAAC's focus is to work with artists in North America as well as to facilitate artists from India to exhibit, perform and produce their work in the United States. This exhibition will promote and exhibit the work of artists from the Indian diasporic community. The exhibition will tour the NYC boroughs, the greater NYC area and other parts of the United States. We aim to attract a diverse audience – galleries, private collectors, media, youth, educators, artists, students, professionals, and general art appreciators. The audience will be South Asian and mainstream; of various religions, sexual identities, genders, ethnicities, socio-economic classes, and age ranges. The exhibition, Erasing Borders: Passport to Contemporary Indian Art of the Diaspora explores the contributions of artists whose origins can be traced to the Indian Subcontinent. This will be the Indo-American Arts Council's 4th Annual Erasing Borders Exhibition. 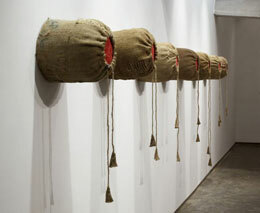 Erasing Borders 2004, curated by Sundaram Tagore, was the first exhibition to focus solely on Indian diaspora artists. Due to its large success, the IAAC made it an annual exhibition. Vijay Kumar curated the last two exhibitions, held in 2005 & 2006. 20 million people of Indian origin shifted countries in the 20th and 21st centuries. Implicit in the term diaspora are the concepts of change and adaptation. Cultural dislocation generally produces unexpected and powerful results. Subject matter is often drawn from the country of origin, while many of the aesthetic values and political concerns come from the artists' newfound situations. Executive Director and founding member of the Indo-American Arts Council, Aroon Shivdasani is passionate about its mission to build an awareness of Indian artists and artistic disciplines (performing, visual, literary and folk arts) in North America. Immersed in the arts, Aroon conceived and produced the first Festival of Indian Theatre in North America, annual Playwrights Festivals in conjunction with the Lark Theatre, several film premiers, two annual film festivals one of New Films from India at MOMA and the other of Indian Independent & Indian diaspora films, an annual Erasing Borders visual art exhibition, as well as myriad fascinating theatre, film, dance, music, literary and fine arts events under the auspices of The Indo-American Arts Council. President of the Indo-American Arts Council Board of Directors, Aroon sits on the Boards of the Queens Museum of Art, The Lark Play Development Company, Nayikas Dance Company, Rave Magazine, Save Bombay Group. Aroon also sits on the Advisory Boards of several other art and charity organizations, as well as the juries of the Emmys, beauty contests, grants, art, film and theatre contests. She has received Outstanding Citizen awards from the City of New Rochelle, NY in 1988 "for the organization and execution of a French Fete to commemorate the 200th anniversary of New Rochelle"; the NY State Assembly in 2001 "for working to build an awareness of Indian artistic disciplines in New York City, to raise money & social consciousness for domestic violence victims, earthquake victims and the victims of AIDS"; from the City Council, NYC in 2002,"for exemplary service to the community"; and an Honor & Appreciation award from the Gathering International Health Professions Network, Greater Hudson Valley "for untiring efforts to serve the community". Aroon's priority above all is her family: the one she was born into and the one she has nurtured with her husband Indur and daughters Sacha and Misha. Their unconditional love and support is her grounding. 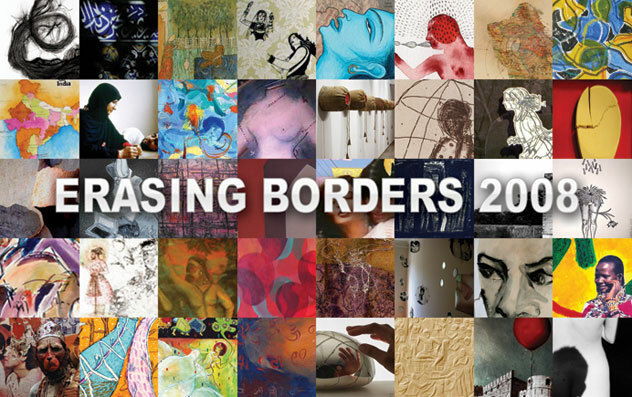 Vijay Kumar curated the 2nd & 3rd annual Erasing Borders exhibition. Vijay studied art at Triveni Kala Sangam in New Delhi, and at Pratt Graphics Center in NYC. He has showcased his drawings, prints and paintings in the U.S. and abroad. Vijay has worked extensively in printmaking techniques and currently teaches etching at Manhattan Graphics Center in NYC, where he was a founding member. His work is featured in many permanent collections, including the Museum of Modern Art, the Brooklyn Museum and the New York Public Library (all in NYC), the William Benton Museum of Art in Storrs, Connecticut, the National Gallery of Art in New Delhi, and the Ashmolean Museum in Oxford, UK. In 2002, his work received the highest prize in an exhibition of prints by the Royal Society or Painters and Printmakers in London. By the late 1970’s there were already a number of visual artists from the Indian subcontinent living in New York. However, only a few (like F. N. Souza, Krishna Reddy and Mohan Samant) after making a name for themselves in India, were already well established here. I had learned their names and become familiar with their work in India, so when I also settled here I was very curious to find out what impact their work had on the New York art scene. Artists Natvar Bhavsar, Arun Bose and Zarina Hashmi were also becoming known in the City. Only these artists names did you see, every once in a while, in the papers and magazines. There were hardly any Indian galleries here then one was in the back of a flower shop. New organizations for the larger Indian community were just being started, one by one. I was part of a loose group of Indian artists who came together to have shows wherever we could, often with the help of the Indian Consulate here. By the end of the 1980’s and in the early 1990’s, a new generation had come to the front. Now it was the new immigrants, or the children of those who had settled here earlier, that were trying to gain recognition. By the time India and Pakistan celebrated their 50 years of independence, the words “desi” and “diaspora” had become commonplace. For many in the earlier generation, the struggle had been how to incorporate the concepts of the “modern” Western art tradition or new materials into their own work. Sometimes it seemed traditional Indian symbols or motifs were just plunked into their compositions, and Sanskrit words put into the titles they chose (whether anyone understood the meanings or not). For the younger visual artists, while modern art and the huge variety of possible art forms were a given, their relationship to their Indian subcontinent remained a subject. In their art they were exploring and reflecting on what was happening around them, the way society was changing, how society saw them and they saw society – in terms of religion and race (especially post-9/11), but also in terms of gender, pop culture, and societal roles and expectations. There is often humor and satire in their work, but sometimes defiance too. (They have their own activist groups.) They are showing their creativity with a heightened independence—free to create and exhibit whatever they want and seemingly (at least) less concerned with financial success. There are many new “Indian” galleries in New York now, fueled by the new wealth in India and the booming art market there. These galleries mostly show work by artists still living in India, but occasionally do exhibit work by these diaspora artists. We are pleased to be able to give these diaspora artists another venue. In this show there are not just mangoes, but mangoes “in the morning”; colors remembered from childhood; images from pop culture including Bollywood films, advertising and fashion; strong social commentary; traditional miniature painting transformed and used for new purposes; calligraphy and script; startling juxtapositions (e.g., Kathak dancers in traditional costume wearing gas masks); work trying to “find home” within the psyche. The artists in this show describe their own work well, as: “a collision and a reconciliation of (her) two worlds and cultures”, as “often the way that memory works, recombining and filtering truths”, or as art “exploring the role of the medium itself in the creation of fabricated identities”. Erasing Borders 2008 is IAAC’s 5th show. This time it was very exciting, and also a little exhausting, to review all the submissions and select the artists for this exhibition. We were happy to have so many artists apply. We hope to be able to include artists in future shows whom we were not able to include this time. IAAC has truly become a resource for visual artists as well as writers, filmmakers and those in the performing arts. I wish to thank Amina Ahmed for her enthusiasm and help, and of course Aroon Shivdasani, who despite facing many hurdles, always gives her full support to the artists. Amina Begum Ahmed was raised in London and moved to New York in 2000. She graduated with an MFA – from the Royal College of Art – Visual Islamic and Traditional Art, under the guidance of Prof. Keith Critchlow & Paul Marchant. 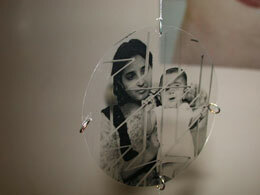 During her two years at the RCA Amina received a bursary & upon graduating was awarded the Barakat trust prize. She holds BFA from Winchester School of Art, a distinction in Art and Design from Derbyshire University and a Foundation from Chelsea school of Art. After Graduating from the RCA Amina embarked upon teaching an outreach program & workshops was a visiting lecturer undergraduate & postgraduate courses. Her works are in private collections, she shows in London & the USA. As well as works with Charcoal on paper a large part of Amina’s work is egg tempera on gesso. Materials that are prepared is part of the work as is the practice of “Sacred Geometry” Her current series of works is Roots Weeds n’Trees, Listening. She would love to visit Kutch more and has three lovely children & only one husband in her private collection. The Indo-American Arts Council received submissions from Two Hundred and seventy artists of Indian origin. Our curator, Vijay Kumar, selected work from among the submissions that would reflect the diversity of the diasporic Indian population in terms of religion, ethnicity, and intellectual predilections. The work of the artists is as diverse as the artists themselves, a reflection of the theme – Erasing Borders. An overwhelming number of submissions in itself is a clear indication on the importance of our serving a platform for South Asian Artists. Hence the dramatic increase in number since the last exhibition. We are thrilled to be able to showcase a diversity in the artists chosen medium of expression, gender and generation. The artist, all exceptional, the works span from the conceptual work of sculptor Asha Gunpat, the mixed media paintings of Vinod Dave, photographic installation by Niema khan Qureshi, the abstract architectural paintings of Reeta Gidwani Karmarkar, the works of Suhas Tavkar who is the last in his generation of NakhaChitra. the rare art of fingernail relief drawing, passed down from father to son, to distinguished Photographers Chirag Rana and Yetish Yetish. and many more. Chirag Rana is a multidiscipline visual artist specializing in fine art photography who lives in Nutley New Jersey. Born in Baroda, India and raised in art environment. Although primarily self taught. He developed his vision with many well known photographers to learn different aspect of Contemporary and Architectural photography and gained international recognition for his work. Chirag won his first award in 1990. Since then he continued to pursue an ever increasing standard of achievement and artistic vision. His passions for photography still make him active in taking candid pictures. Niema was born in Rawalpindi, Pakistan. She grew up in England and studied at Oxford Brookes University where she completed a Bachelors Degree with Honors in Visual Studies. She then went on to complete a Masters Degree in Fine Art at Chelsea College of Art and Design in London, England. After moving to the United States, Niema worked as a Museum educator at the Museum of Contemporary Art in Chicago, Terra Museum of American Art and The Art Institute of Chicago.? ?Niema's work addresses colonial experiences from the perspective of family history, integrating the experience of immigration and the idea of home. Niema has exhibited her mixed media work in the US as well as the UK . With contracts I go into public places and ask for strangers' souls offering nothing in return. The contracts are sealed folded and then into jars. The jars are largely indiscernible from one another. Anna’s watercolor and gouache paintings integrate abstract form with delicate figurative detail. Anna's recent work refers to the interior of the physical body as starting point for exploring the non-physical aspects of self. 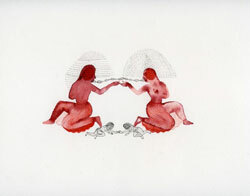 These small paintings attempt to trace the intangible impact of personal experience on the body at a microscopic level, and within these microcosms are found forms which connect to the archetypal language of Indian mythology and ritual, a recurring theme in Anna's work. Studio Art Department, Manhattanville College, 2900 Purchase Street, Purchase, NY 10577. Artwork and information on all participating artists is on our website.